Founded in 1954 by Ed Sylvis, foundation bolting contractor, Seismic Safety is widely recognized as the premier Southern California Resource for residential Earthquake and Foundation reinforcement. News media, home owners, Earthquake and Seismic experts, structural engineers and Real Estate agents all rely on Seismic Safety, located in Pasadena, California, servicing the greater Glendale, CA. 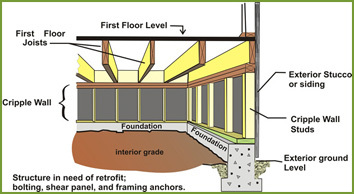 Is your Home Foundation in Glendale Retrofitted and Earthquake Ready? Every homeowner in Glendale California must consider earthquake safety. Are you sure that your home can stand up to the next big earthquake? Your home is your biggest investment and protects your loved ones and your possessions. Don’t wait, call us at Seismic Safety with questions or to schedule a comprehensive inspection. 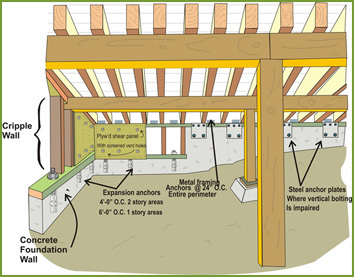 Earthquake bolting for wood frame buildings addresses what is known as “The Earthquake Weakness” – which involves the attachments of the structure – your home – to its foundation. Seismic Safety will send their foundation experts to you home in Glendale, CA, evaluates and performs structural and foundation reinforcements that will reduce the risk of earthquake-induced damage to your home. Why is Earthquake house bolting important to your home in Glendale, CA? Recent earthquakes have shown that if a building has weak cripple wall bracing or is unbolted, it may slide off its foundation even in certain moderate earthquakes. Our house bolting contractors have seen buildings whose Cripple stud walls have toppled over, and the buildings have collapsed and slid. Fallen buildings may catch fire or need extensive foundation repairs to restore occupancy requirements. Is my Home bolting in Glendale at Risk? The experts here at Seismic Safety are the best in the home foundation bolting repair in Glendale, CA. We are the best in house bolting industry and we are happy to help answer any questions you may have about foundation bolting, cripple wall bracing, and other factors that affect your home’s earthquake safety.